I first became aware of the existence of orbs when I was 23 years old. I was a young married woman with a small child living on Long Island New York. My husband was a Vietnam War veteran and we were starting our new life outside of the military together with our toddler son. We were living on the top floor apartment of a two family house located in the town of Babylon, New York which is located along the south shore coast of Long Island. Life was going along as one would expect for a young couple trying to adjust from being a military family back in to civilian life. We were doing OK. We were making ends meet and had a nice place to live and a happy little boy to fill our time. We liked the place where we were living as it had a large deck off of the kitchen which had a stair case leading to a small but nice fenced in backyard for my son to run around and play happily with his trucks and toys. We especially liked the fact it was surrounded by a wooded area on our bedroom side of the house which made it private and quiet at night. Life was going well until the Orb visited. One August summers night around ten PM I was in my bedroom reading before getting ready for bed. My son was long asleep down the hall in his room and I was enjoying some time to myself before going to bed doing what I loved most which was reading. I remember my husband calling down the hall asking if I wanted my ritual cup of tea I usually indulged in before bed. I walked in to the hall not to wake my son and nodded yes to my husband who retreated back into the kitchen to turn on the tea kettle while locking up for the night. I remember that I was wearing a long peasant dress which was in fashion at the time and threw the long tee shirt I slept in on to my bed but remained in my peasant dress for reasons I have long forgotten. I say this as I remained in that peasant dress for the remainder of what took place that night. As I walked back into my bedroom I walked back around to my side of the bed which was on the side of the room with a large window that faced a group of tall pine trees. The trees were on a small plot of heavily wooded land that separated the house I lived in from the neighbor next to us. As I passed the window something caught my eye. I stopped and walked up to the window to see what it was. As I stood against the window I found I was looking at a round glowing ball of light about the size of a dodge ball or large ball you would play with in a pool. It was just hanging in the tree looking in to my window. It was very odd as it looked to be filled with some type of gas or moving material. Today we call it plasma. Years ago there was nothing like this seen or talked about so I had no idea what I was looking at. I watched this thing hovering in the tree for a few seconds as I immediately started to fill with a deep fear that I did not know what it was and it was without question looking back at me. I called for my husband who was walking down the hall towards our room with my mug of tea in his hand. As soon as he entered the bedroom I called him to the window and pointed to the red Orb looking back at us from the trees. My husband stood there for a few seconds looking at this thing before whispering to me almost so this thing could not hear -- "What the hell is that?" He talked more to himself than to me about who would place a light in the tree like that and how was it that it was hovering in midair as we both stood staring at this thing. Suddenly the red orb started to move slowly from the tree more towards our window still hovering silently in the summer night with its swirling interior looking at us as we looked at it. I started to feel dizzy as if I was going to faint and told my husband I had to lay on the bed. He wanted to go outside and see what the thing was with his hunting rifle but I grabbed his hand and begged him not to leave me or our son alone in the house or to go outside alone. I asked him to call the police as it must be someone doing something crazy in the neighborhood. My husband started to stumble around the room as if the floor was moving beneath him. The last thing I remember is that he sat next to me on the bed holding his head. We both woke up the next morning laying fully dressed on top of our bed. We never got into the bed or took off our clothes. My tea sat on the table next to my bed untouched and my husband woke with his shirt on backwards. We both felt disoriented and ill. I threw up and my husband had trouble with his balance for about an hour. We ran to our son's room who seemed perfectly fine and without any harm. My husband went outside and searched the entire area for a sign of what it was that we encountered in the tree the night before. He could not find any sign of that orb at all. He climbed in to the trees and questioned the neighbors, no one had any idea what he was talking about. As the days passed I started to have one flash back memory of walking as if in a trance out on to our backyard second story deck. I was walking behind my husband. I could feel my peasant dress blowing and my hair as if there was a breeze blowing on us. I could feel a glow of some kind of light surrounding us. My husband could only recall fear. He told me he felt as he did when he was deep in battle in the jungle. I never did see that red Orb again but I do know it changed my life forever. Whatever took place that night made a drastic change in my husband’s personality. We did not remain married and I do not blame all of that on the red orb I will however say without question it had a part in changing us both forever. 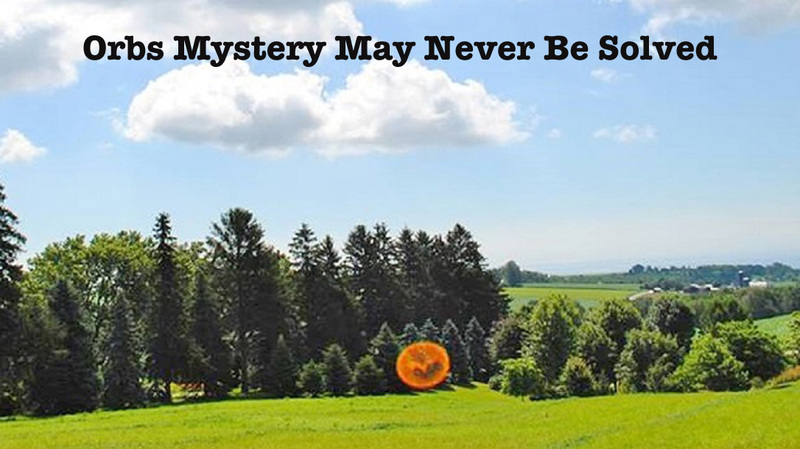 I have been sent many reports over the years about red or orange Orbs about the size of the one I encountered from people who discovered them hovering in their yards , fields and more often looking inside of their homes and peering in through windows. I believe this type of Orb is used for surveillance purposes. I also think if it has the opportunity it does interfere possibly with people physically. That is left to opportunity and chance. 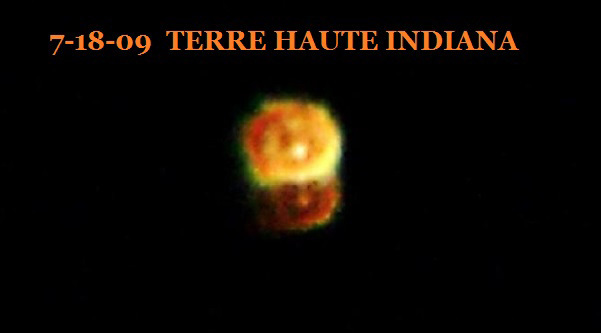 I have been sent or told about orbs of this style and size from people living all over the world and in all kinds of living environments from large isolated farms to crowded city high rise buildings. Not that many years ago a woman wrote me a letter describing how she watched a red Orb hover outside the large window of an apartment about 30 stories in the air watching the people inside obviously without their knowledge. The Orb hovered swirling in silence peering into the high rise building for about ten minutes. The woman called the police who did not respond to her call to her knowledge and also called the doorman's desk of the apartment building that had the apartment located in it that the Orb was looking in to. By the time someone responded to her request that this oddity be looked into the Orb in her own words "Silently floated away and up into the sky ". I have no idea what this type of Orb is. I do not who controls them or what they are used for. I can only tell you from seeing one with my own eyes that they do exist and can be dangerous. The next type of Orb that I find to be most common and widely reported are the smaller soft ball to golf ball or even smaller white or light colored glowing balls of light. I have found that most of the reports that I have been sent or that I have read about concerning this type of orb have more of a spiritual definition. They are often caught by photo or video by those who are engaged in ghost research or those who are having interaction with spirits of those who have passed away. I do know that I have heard many stories of small orbs being seen by those who have lost a close loved one which makes me believe it is the energy of that loved one staying with the ones they love during times the ones they left behind may need them. I think that entering the dimension in which we live may be difficult for the energy of human life and manifesting as an orb of light a way for them to interact in our living reality. This however is not limited to loved ones and spirits we want to interact with. It seems that many energy forms that once may have lived in human form linger among the human dimension for reasons we can only assume or try to understand. You will see evidence of this in the ghost hunter communities where there is no shortage of orbs of light being videoed or caught in photos while the hunters are actively investigating areas thought to be haunted. It seems apparent that the energy of human life can develop the ability of showing It seems apparent that the energy of human life can develop the ability of showing as an orb of light or energy once they leave the human life form. I simply think of this type of orb as being part of the spiritual realm and very different from the red orb I encountered or the larger craft size orbs that are seen all over the world. 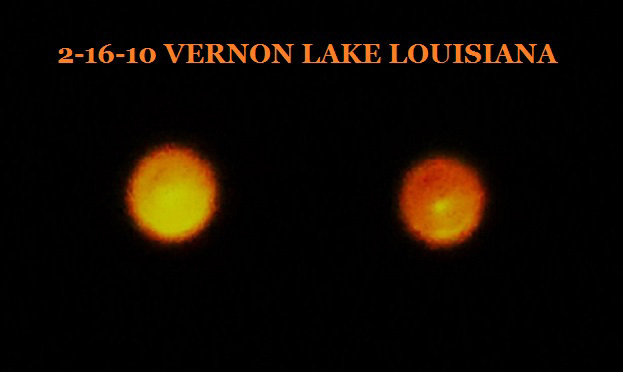 The fact remains we do not know for sure due to the lack of serious investigation what any of the Orbs are that live float and seem to watch us come from or what they want or if they are living creatures or mechanical devices. My feeling is that the Orbs are from many different sources ranging from spirit energy to multidimensional roots that are able to cross over to our realm to observe how we maneuver in our dimension. I do know the most commonly reported Orb is that of the smaller white ones. 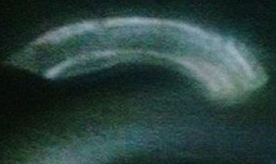 I can only logically believe they come from many sources starting with spots on lenses or reflection of light source from the point of being videoed or photographed to spiritual or dimensional visitors. Whatever the source of this type of Orb or for that matter any type of size of Orb I caution anyone who has an encounter or sighting to follow all rules of safety as one thing remains true in all of these cases. That fact is that one really knows exactly what these objects are or why they are here. It may be a simple sign of reaching out from a loved one who has passed away however it could also be an energy from something more sinister or here for reasons that may be harmful or not for the good of those around them. Always deal with these strange objects with great care and in all cases the best advice would be to quickly leave the area when dealing with that which is unknown. I do feel that this type of type of Orb is an energy or life form that is trying to interact with us in our form as living humans. It makes it a curiosity that easily draws us to wanting more information which may tend to allow us to make choices that could prove dangerous. Please keep this in mind if you find you are the one facing a strange ball of light or Orb and know that is could be the energy of a loved one or that of an entity you would not want to deal with and need to keep safety and caution first in dealing with them. The last type of Orb I want to discuss is in my mind without question a craft. 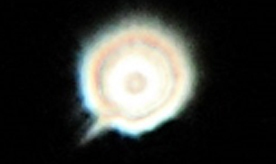 This type of Orb is reported in sizes from that of a small car up to the size of a football field. 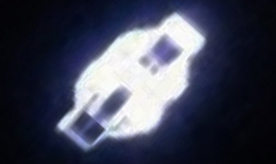 They are seen flying often in formation with other Orb crafts and seem to without question be under intelligent control. I have had reports of this type of craft sent to me often over the past few years. Many of the Orb craft UFO objects that have been reported to me have been seen coming from or going out towards the Atlantic Ocean however I know they are being seen all over the world. 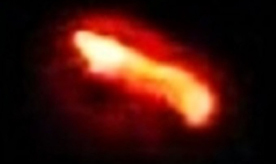 I know that this type of UFO Orb object is solid in color and that the colors range from white and yellow to reds and oranges. I have been told that the interior of these large craft size Orbs seem to of a gas or plasma nature making them swirl or seem gas like instead of a solid metallic type of material. I have spoken to people who thought these large UFO style objects seem to have a living feel to them which made them believe they were either made of living material or part living and part machine in nature. 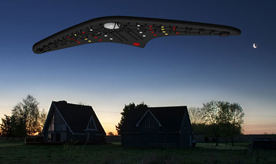 My family and I did see a group of this type of UFO Orb after hurricane Sandy and also viewed the gaseous interior of the Orb and felt that it did have an organic living feel and look to them but also were without question organized piloted machines that were flying in formation. 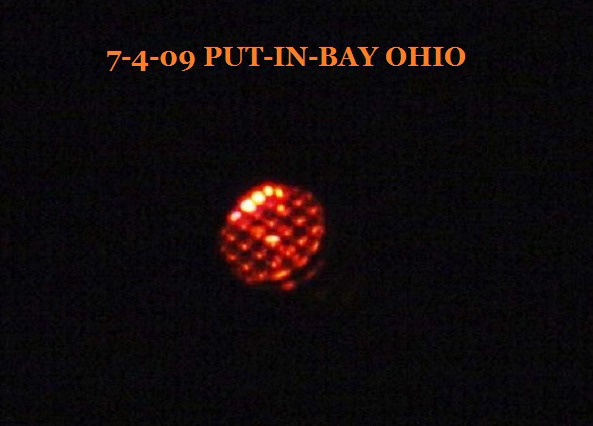 Like the other reports the Orbs we encountered over Long Island New York the objects flew without any sound and were unlike any other lights we have ever seen in the sky as you could look into the bright red or white swirling light of the craft without the glare that other lights of the same size would react with the human eye. You did not have to blink or adjust your eye as you were able to easily look directly into the light. I have been told by those who have sent me reports concerning this type of UFO Orb craft that these large Orbs will stop instantly during their flight to hover over and observe the people they find who were caught watching them fly over them. I also was told that the people did feel great fear and danger when this occurred and were greatly relieved when the object or objects would regroup and continue on their way after a short time of observing the humans who were watching them pass over. 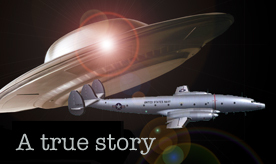 In all cases those who reported these encounters all felt that the Orbs were deciding if they wanted to continue or engage in contact with the people they hovered over. I believe that this Orb type of craft is an alien or dimensional craft that is not only here to observe but in some cases have encounters with us. I find this type of craft may be some kind of living creature and may function on its own or simply be made of a living kind of material and is piloted by a life form we are not yet aware of. I do not think they are the same as other UFO or alien or dimensional life forms. I do think they are something different. I believe we have many different types of life or energy intelligent sources that do visit and observe what goes on with planet earth and the humans and other life that covers this planet. One day we may understand a great deal more about these things but for now I fear we will stay as we are with miles to go before we are able to grasp the workings of other life forms or the facts of the universe, dimensions and time that is around us. I do know we need to concentrate on the world we live on and need to understand it before we can ever hope to comprehend the outer workings of cosmos. I doubt other advanced life forms who do observe us are as interested in us as we seem to think they are. I have to laugh when I read the self-importance we place on our species and the interest those far advanced have in us. They may use us for biological material or to observe as we evolve but trust me we are still killing machines who cannot live together without war or feed all who do live on this planet and seem to go out of the way to destroy our planet when we really do not need to do so. Look at how we kill and fight over energy sources and refuse to work with what we have due to politics or policies that are keeping us stuck like fools going nowhere fast. I think for now we will continue to be visited by orbs of all sizes, as well as other unknown objects. Some of us will have encounters that are close up and others may end up taken and some never returned. I do not think any of that is due to change for the human race for a very long time. We have miles to go before we can join those who visit us and move on by. I will post images and past articles with this article on my blog concerning the subject of orbs. 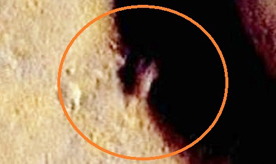 Is NASA withholding evidence of alien life on Mars?